Juan Escovido (son of the great Pete Escovido) has an R&B band that performed at the Temescal Street Fair. Juan plays congas and this guy could tear up a soul song. Can you believe I didn't get his name? The band had people dancing in the street. 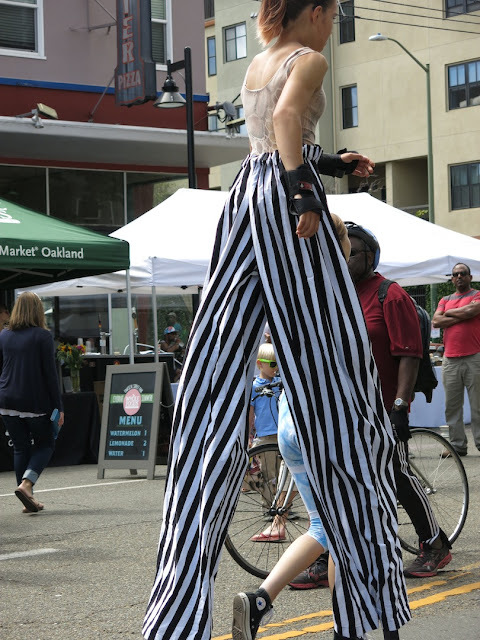 Stilt walkers are always a hit at street fairs. Whenever I see these folks I can't help but think, "How do they do that?' Whatever they do, their balance is always perfect. And with such confidence, too. Linked to ABC Wednesday. This man and his daughter were out for a stroll at the local street fair. They both seemed to be enjoying the sunshine and mellow vibes. Cute, don't you think? This lovely pachyderm is found on a wall in the Temescal neighborhood. It took me a while to see the animal; then I admired its fluid lines. I'm pretty sure it went up in late June but didn't notice a signature.. The skies have pretty much been like you see behind the parasol. The past several days have been sunny and warm with a bit of wind in the afternoon. Perfect for outdoor fairs like this one at Jack London Square. Linked to Skywatch Friday. The annual Temescal Street Fair has several music stages up and down Telegraph Avenue. This group was performing in The East Bay Depot for Creative Reuse, our local recycle/upcycle/reuse store. These guys performed in the tradition of Woody Guthrie, singing original songs about injustice and social struggle. Sorry to say, I didn't get their names. It's amazing what you see at the Temescal Street Fair. Here we have a demonstration of circus acrobatic art presented by Kinetic Arts Center. Not only do you have to bend your spine in various directions, but you have to do it 6 feet off the ground. Uh, no thank you. Linked to ABC Wednesday. One of the many mini rides at last week's annual Temescal Street Fair. Recently there seems to be a number of food and entertainment joints that have closed down in this one block stretch of Uptown. When this happens, street artists move in and use the spaces to ply their trade. Here is a piece by GATS on what seems was a sign on a now defunct business. You can't miss his style. This is a half face from the cheeks up with abstracted names of street artists running down the nose. To my eye it has the look of Maori tattoos. Don't know who drew the woman, but she appears a smidge uncertain about the guy she's glancing at. This is Z Cafe, a popular restaurant with a noisy bar. Why is a new car perched out front? Because a car dealership occupies the other half of the building. In fact, the cafe space was carved out of part of the showroom. For a while the cafe definitely smelled like new tires. I guess the wall separating the two sides wasn't sealed off well enough. Thankfully, the problem was eventually solved. Linked to ABC Wednesday. Mr. Nite Owl looks like quite the dandy. Found in Uptown, this Cannon Dill mural takes the place of this one. It's six to 8 feet high and viewed over the tall front fence of a Victorian-era house. Cannon Dill is one of my favorite street artists. Walking the Lake is always interesting. You never know when you're going to run into a Super Hero.